Now in the 90s, it is common knowledge that "psychics" were used in specialized intelligence units belonging to all countries during the "cold war". What you must remember is however that back in the late 1950s to obtain funding for such covert operations the word "psychic" was definitely taboo. Words had to have a plausible scientific meaning or a made up one, or completely baffle the government funding bodies so the invention of the words "Remote Viewing", "Sensitive Hearing Verification", "Project Invisibility", "Project Astra" and many more came into being by covert operations managers. Where do you suddenly find people who posses psychic abilities? During the 1950's in all countries there was a rush to scour magazines, journals and parapsychology establishments etc. relating to psychic matters, the psychic war rush was on. Once some one was found purporting to have "psychic abilities" they were approached by selected intelligence agents covertly and very subtly put to the test. In 1973 I knew of one medium who lived in Sussex who had been approached by a man for a "reading" in 1962. She thought that (a), it was firstly strange that he booked nine appointments to see her during an eleven week period, but secondly that he posed "out of the ordinary" questions that one would ask of a medium. Before she died two years ago, she stated that on one occasion he asked her to describe what he had in both his front and back garden after giving her his address which was about two hundred miles from where the medium lived. He asked her equally bizarre questions she thought for someone claiming to have a departed loved one, he asked very few questions about his love, from the lengthy conversations I had prior to her death about these "business men", how right she was. Contact is virtually unlimited if the psychic is good. It is used on a regular basis still today by many groups and despite what is stated by the various intelligence units around the world. I have been running, training and setting up several C.S.E.T.I. Field Teams (The Centre for the Search for Extraterrestrial Intelligence) on the South Coast for the purpose of initiating CE5&rsquo;s. Dr. Steven Greer, is the founder and director of CSETI, which has its headquarters in America. Very briefly CSETI came into being after Steven had visited Alton Barnes in Wiltshire during the early 90s. He was near Woodborough Hill after a sky watch when he "felt" something near. He grabbed a torch and flashed three times in the direction he felt the object was. Immediately the UFO responded by flashing back three times, communication and a CE5 had been established. The next day a Crop Circle was discovered in a nearby field, the shape which is used by CSETI as their emblem. (See their Web Site Page) Since those early days much research has been carried out by Dr. Steven Greer and the C.S.E.T.I. unit to perfect the art of communication and CE5s using a combination of Remote Viewing, Coherent Thought Processing, Light and Sound. I know my wife who is one of Britain's top mediums, counting amongst her clients stars of stage, screen, television and nobility has many of the abilities which would have been much sought after during the cold war. A few years ago I had presented a lecture to a large, mainly scientific audience, on the correlation between Crop Circle Formation shapes and symbols in ancient cultures. I was approached afterwards by a neurologist from the audience who asked me if I thought that human beings were responsible in creating these works of art in the landscape. I thought at first he meant going out with a plank and ball of string, but he went on to explain that when the brain goes into alpha, beta and theta rhythm, as in a meditative state, the brain emits microwaves. This hit me like a bombshell and I decided to carry out trial research into this area. In the October of that year I asked my wife if she would draw a pattern on paper for me, then a group of eight trusted people whom I knew to be "psychic" meditated on the pattern each week from October until the following January. The piece of paper then was placed in an envelope and sealed. I next posted it back to our address (so that it had a date stamp on it) and was handed in to my bank manager unopened. In late July of that year the shape turned up in the form of a Crop Circle Formation. I was ecstatic and thought I had solved the Crop Circle mystery. During the following Autumn I recruited four other teams from different parts of the world to repeat the experiment. The experiment achieved about a 85% success rate and I thought I had the answer. Should any readers wish to tryout this experiment I would be pleased to hear of their results. I was requested at the same time to carry out some research on behalf of Dr. William Levengood and the BLT Research Unit in America. My part of the research was recording the details on Crop Circle Formations, size, shape etc.. and collecting samples of the crops both from within and outside of the formations and then returning the samples to America for laboratory analysis. I was later during the research project (which is still going on) to find out that the scientist believe very much that one of the causes for the Crop Formations is a type of microwave energy. The story did not end there. After a Conference in 1994 held at London that I presented a lecture, I was approached by members from The Wessex Sceptics, an American who was coming over to England each Summer to create hoax formations, and three other British hoaxers. They had over a period of time all experienced what they all termed as "strange things" that had been occurring to them. I have also had recent reports (this year) from one of the "Circle Makers" (another group of people that hoax formations) of "strange things" that had been happening. It would appear that the "hoaxers" would gather together at one of their homes, design the shape of the formation and where to "lay" it down and a date for their creation. Several times they would meet up at the appointed field only to find a replica of their design already "completed" in the shape of a crop circle formation. At one stage the leader suspected that his colleagues were trying to "get one over on him" by meeting earlier and "laying" down the formation. He became slightly paranoid and decided to draw up a blue-print for a formation on his own, in secret and then at the last minute to meet up with his fellow hoaxers knowing full well that only he knew the design, the location and date for the exercise. Imagine his total disbelief when upon meeting at the field the formation was already completed. Another thing that has happened numerous times is the appearance of UFO's whilst they had been making their creations and this has been happening this year also. Are these people "creating" the formations by mind power? Are they drawing in the UFOs via mind power? I know during the CSETI field trips that we have been successful in bringing about CE5s so who knows the extent of the power of the mind. As any neurologist will tell you, we know so little about the mind. 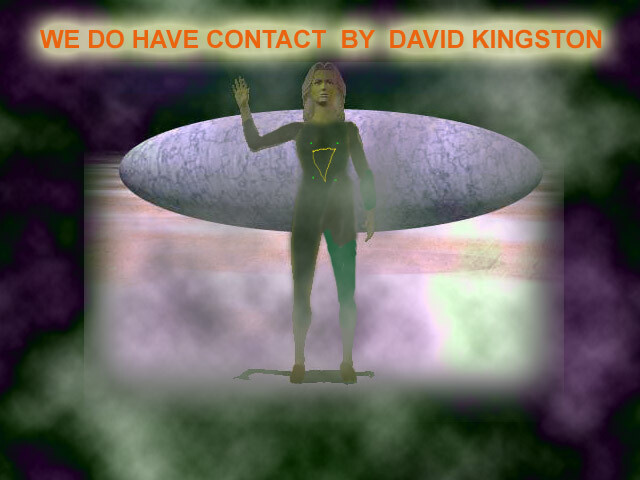 Maybe contact has to be made via the mind, heaven knows it has to be a lot quicker than conventual radio waves. I could broach the subject of parallel universes, spinning disk propulsion and the works of Nobel Prize winner David Bohm on holographic integration but perhaps I have given you enough food for thought in this article.